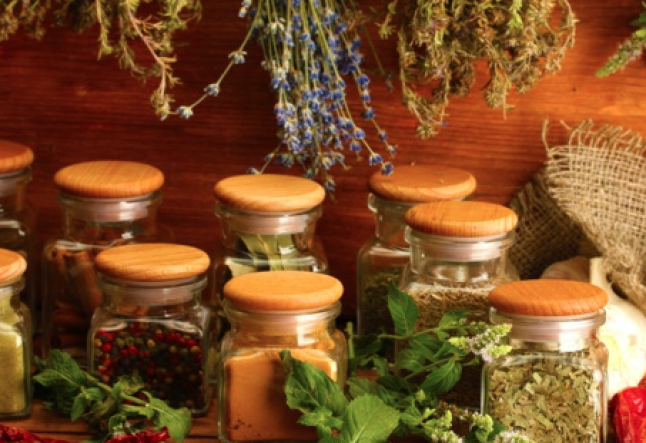 Ayurveda is the ancient Indian system of healing, based on natural and holistic methods. It teaches us that everything is made out of the five elements: Earth, Water, Fire, Air, and Space. The proportion of these five elements in any physical or organic matter determines its properties. The five elements form three different energies in our bodies. The energy of movement, called Vata is made of air and space elements and controls respiration, circulation, elimination, nerve conduction, creativity, and the sense of touch and hearing. The energy of metabolism, called Pitta is made of fire and water elements, and controls digestion, assimilation, temperature regulation, skin complexion, intelligence, and the sense of vision and taste. The energy of support, called Kapha is made of earth and water elements and controls growth, immunity, lubrication, strength, compassion, and the sense of smell. The next important concept is that of body constitution (Prakruti). In Ayurveda we believe that everyone has a unique balance of these three energies in their bodies. That balance, called body constitution, is set at the time of conception. So we have these seven possible body constitutions (Vkp, vKp, vkP, VKp, vKP, VkP, or VKP). The uppercase letter denotes the prominent energies in a constitution. Commonly there are one or two prominent energies in a persons’ constitution, or rarely may we find an equal distribution of the three energies. As we will see next, our body constitution determines not just our physical and mental characteristics, but also our predispositions to different illnesses. Ayurveda tell us that as long as we lead a lifestyle conducive to the balance of our energies, we remain healthy. When our lifestyle goes haywire and unnatural, due to stress related poor choices, one or more of these energies go out of balance, and that’s when we fall sick. As you can imagine now, the first step towards healing is to determine patient’s body constitution and which energies are out of balance. The best way to do that is to consult with an Ayurvedic practitioner. The “Vata" energy is made of air and space elements and controls five basic movement functions in our body: moving air or respiration, moving blood or circulation, getting rid of waste or elimination, nerve conduction, and movement of food inside our intestines. Its predominant location is in the colon and other organs that develop from the hindgut. The sense of touch and hearing are controlled predominantly by the Vata energy. People with a Vata predominant body constitution are typically slim with a low body weight, a nervous predisposition, small active eyes, cold-cracking joints, and a dry and rough skin. They are physically and mentally very active and restless, their digestion is irregular and their immunity weak. They are predisposed to anxiety, addiction, arthritis, and constipation, especially during the fall season. For people with a Vata predominant constitution it is recommended that they stay regular and warm, avoid any stimulants, as they are prone to addiction, sleep for 8 hrs, prefer sweet, sour, and salty tastes and avoid bitter, pungent and astringent tasting foods. Most dairy products, grains, spices, and lentils are good for this constitution, but they should avoid raw veggies, and airy foods like chips, wafers, and bread. Frequent massage with warm sesame oil is highly recommended, along with the listed poses and breathing techniques for their Yoga practice. Chanting OM in the Gyan mudra and occasionally going for enema with medicated oils will help balance the Vata energy. The “Pitta” energy is made of fire and water elements and controls five basic functions in our body: digestion and assimilation, temperature regulation, intelligence, and skin complexion. Its predominant location is in the small intestine and other organs that develop from the midgut. The sense of vision and taste are controlled predominantly by the Pitta energy. People with a Pitta predominant body constitution are typically medium in built, have sharp sensitive eyes, warm oily skin, thin straight hair and tendency towards baldness. They are intelligent and aggressive and can be critical, short tempered, and perfectionists. They are predisposed to high blood pressure and heart disease, inflammatory conditions such as Crohn’s disease and colitis, migraine headaches, and acne. For people with a Pitta predominant constitution it is recommended that they stay calm and cool, avoid heated environments, situations or discussions, avoid frequent use of stimulants; avoid hot and fried foods, and also sour and salty foods. They should prefer juicy and sweet tasting fruits, whole grain products, beans and lentils. They should avoid red meat, white flour, and aged chesses. Frequent massage with warm coconut oil is highly recommended, along with the listed cooling yoga poses and breathing techniques. The “Kapha” energy is made of earth and water elements and controls five basic functions in our body: growth, immunity, lubrication, strength, and compassion. Its predominant location is in the stomach and other organs that develop from the foregut. The sense of smell is controlled predominantly by the Kapha energy. People with a Kapha predominant body constitution are typically large in built, and are strong, physically and emotionally. They have big, beautiful eyes, thick and dense hairs, slow digestion, and strong immunity. They are calm, loving, and tolerant, and may be slow in mannerisms. They are predisposed to being overweight / obese, and develop diabetes, bronchitis / asthma, and tumors / cancers. They are also at risk for depression and possessiveness, especially in relationships. For people with a Kapha predominant constitution it is recommended that they stay active and warm, and involve in vigorous and stimulating physical exercise on a regular basis. Regular sauna, steam bath, and massage with mustard oil are recommended for this body type. In foods they should prefer: salads, beans and lentils, whole wheat products, vegetable stews and curries, buttermilk, and heating spices such as chili and pepper, garlic, and ginger. They should avoid: deep-fried foods, all nuts, rice, banana, cheese, yogurt, meat, fish, and white bread. Ayurveda suggests lifestyle changes, healing Yoga Poses and Breathing techniques, Panchkarma treatments and Personalized Herbal supplements as modalities to re-establish the balance of energies.